@fromhomage is Little Wallop not Alex James presents ? But surely they can’t be exactly the same cheese? @fromhomage @thecheesepress yes both made by Whitelake; one under Alex James brand, one not. Think the only difference is slight weight? Righto, so which one was mine then? @fromhomage @thecheesepress Basically similar, but Eve uses raw milk & rennet; Little Wallop uses thermised milk and is veggie-friendly. Ah-a. So now I was getting to the bottom of it. The shop I bought it from was definitely the kind of gaff that would plump for the raw milk sort of cheese but I needed to be sure. ‘Why don’t you phone them?’ someone helpfully suggested. So I did (wondering why I hadn’t done so three days earlier). Eve it was. Eve is an unpasteurised, soft, goat’s milk cheese that’s washed in Somerset Cider Brandy and then wrapped in vine leaves. It’s made by White Lake Cheese, who also make Rachel, which I wrote about back on Valentine’s Day. White Lake is a partnership between Roger Longman and Pete Humphries. Pete used to work for Bath Soft Cheese but wanted to branch out on his own and Roger comes from a long line of Caerphilly makers. In 2004 they got together and a whole line of lady-named cheeses was born, including Eve in 2011. The farm is home to a herd of 600 goats, a mixture of breeds that includes Saanen, Toggenburg, British Alpine and Anglo-Nubians. The goats are milked twice a day and will produce about two and a half litres of milk. Starter culture and rennet are added and, once it’s turned curdy, the curds are cut by hand and put into moulds to drain overnight. They’re then taken from their moulds and sent to a room to mature (which sounds a bit like getting sent to your bedroom, with your Dad yelling ‘Grow up! after you). Each cheese is washed lightly in Somerset Cider Brandy and wrapped in a vine leaf, underneath which grows a white fluffy mould (and apparently the naturally occurring mould in this part of Somerset makes some cheese glow fluorescent under ultraviolet light, which is one of the coolest cheese facts I have ever heard). It’s hard to tell from the photo but Eve is about the size of the palm of my hand. The leaves look tough but actually give way easily beneath a sharp knife. The texture of the paste beneath is very much like Dairylea, smooth and spreadable. I doubt any artisan cheese-maker wants one of their babies compared to Dairylea but the comparison ends there as the taste is rich and has that slight citrusy tang of goat’s cheeses. It would be a lovely addition to a cheeseboard (especially if you turned all the lights off to reveal your day-glo goat’s cheese), or indeed just to scoff down with some crackers when no-one else is around. Oh yes – White Lake makes cheeses for Alex James too. Little Wallop is the one that is Eve’s doppelgänger, although I haven’t tasted that one…yet. Additional research from the New York Times, Paxton and Whitfield and The Cheese Shed. Your prefer Oasis to Blur? Oh dear, the Suffolk Cheese Crawl may be seriously endangered. I have to say, though, that Eve looks a real temptress. Did you eat an apple with her? A real detective story… That cheese looks so terribly grotty, I bet it’s/was wonderful. I do wish I could just wander along and throw such cheeses in the basket; but this is Brazil. Ohh I really want to try that one out it sound fabulous. I have a particular soft spot for the glow in the dark idea! I know! I’m fascinated by that! 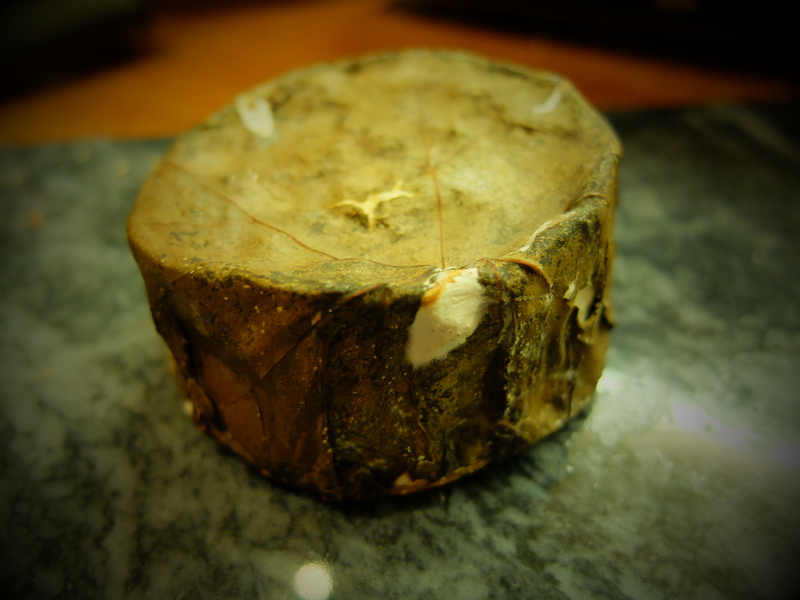 You should incorporate it into your cheeses – historically-based cheeses for ravers! All about ‘Eve Cheese’ then?! Central London – good old Paxton & Whitfield. Thanks – I really need to pay them a visit!! Pah! I only have to hear that ‘he lives in an aahse, a very big aahse, in the cantrrrry’ song and my teeth start to itch! This didn’t have the smelly feet meatiness of most washed rinds – my partner loathes them but he liked this. They must do something differently as it’s not sticky and orange either. I don’t know if I could find anything like that here in Minnesota, but I am going to check with my friends who know cheeses. Apparently you can get similar things in the US, though not sure whether specifically in Minnesota! There’s one called O’Banon (goat cheese wrapped in chestnut leaves, soaked in bourbon) and Sozzled Pearl (goat/cow wrapped in bourbon-soaked vine leaves). Also, Rogue River Blue, a blue cheese wrapped in vine leaves soaked in pear brandy. Happy hunting! Oh! Thank you for the names. I love goat cheese and this would be very special. I’ll look for them. I found a place to buy Obanon cheese in town. Sozzeled Pear is made in Maine and not available here. Rogue River is from Oregon. Also is not available here. But It’s fun to know more about the cheeses! Oooh, did you try the Obanon? There’s a good book about US cheeses called It’s Not You, It’s Brie. Haven’t tried it yet! I’ll see if I can find the book though because you have made cheese so fascinating. Plus I live next store to Wisconsin where there are lots of fine small farm cheese producers there. There was a cheese festival last weekend here in MN. I missed that but, I want to learn more. There some great ones made here in Minnesota too. Yes, Wisconsin is the cheesiest! Glow-in-the-dark cheese – now I’ve heard it all! If I found one that did that here I’d be very suspicious about its provenance! Sounds delish, though – love goat’s cheese. I’m so intrigued about the glowing in the dark thing, I can’t tell you!